While UFC 232: Jones vs. Gustafsson 2 was a commercial success, the main event didn’t live up to the first between the two light heavyweights. And I suppose in retrospect, how could it? Jon and Alex took each other to the absolute limit at UFC 165, with “Bones” digging deep and snatching the win from Gustafsson in the dying minutes of round five. UFC 232 saw Gustafsson hobbled by a groin injury in the first and finished in the third. It’s just how the fight game goes. Who knows what would happen if we ran things back for a third fight? That’s the way Alexander Gustafsson’s manager is looking at things too. In a written interview with MMA Junkie, Nima Safapour discussed his client’s future. As for Jon Jones’ strange pulsing steroid metabolite problem? Gustafsson wasn’t shy leading up to UFC 232 when asked if he thought Jones was cheating. “Yes, I do,” he said. Jones took to social media following news that he had passed several drug tests on the night of UFC 232, as if that somehow erased the controversy of multiple positive tests leading up to the event. Well yeah, it was just one of the strangest drug testing fiascos in UFC history that resulted in the event getting moved to a different state last minute. We’re not surprised Gus was focused on it. Maybe their next fight will go down without all the distracting drama. And it could happen sooner than you’d think. UFC 235 should tell us whether Jones can sell as many pay-per-views without a legit challenger like Gustafsson across the cage. If he can’t, we could see a third fight between the two before the end of 2019. Alexander Gustafsson is looking for a quick turnaround following his loss to Jon Jones at UFC 232. 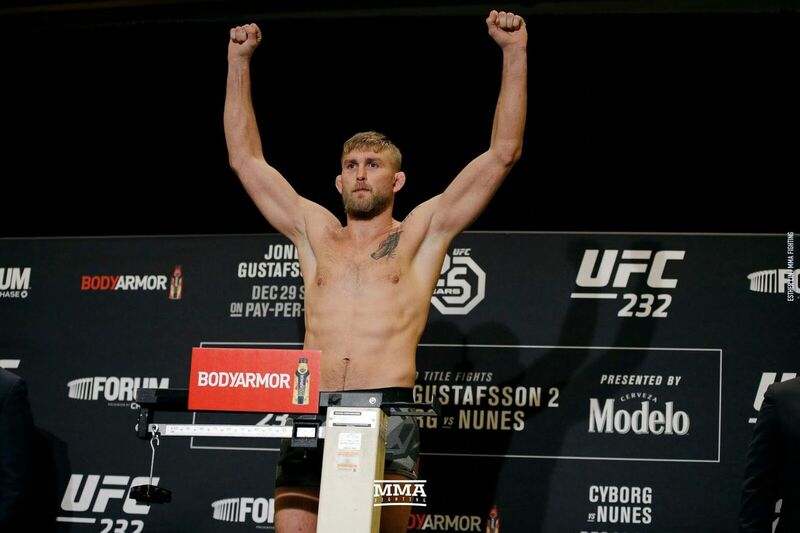 After coming up short in his bid to capture the Ultimate Fighting Championship (UFC) Light Heavyweight title on three separate occasions, Alexander Gustafsson may be running out of opportunities to win the division strap. Especially if Jon Jones decides to stick around the 205-pound division for the remainder of his career. But that doesn’t mean “The Mauler” is giving up on his championship dreams so easily. Being one of the biggest 205-pound fighters in the division, a move up to Heavyweight seems like a simple transition for the towering Swede. Banging with the big boys of the 265-pound weight class is something that could intrigue Gus into packing on a bit more weight in search for gold. “Yeah, of course. The heavyweight division is also an alternative. I’m here to fight, either if it’s at light heavy or heavy. I have to talk to my coaches and see what’s next,” he concluded. With division king Daniel Cormier — who also holds a championship win over Gustafsson — set to retire pretty soon, the weight class will be searching for a new man to lead the big men in 2019 and beyond. That means a win or two up north could put Gus back into a title fight sooner, rather than later. If he does indeed choose to stay at 205-pounds, there are several fights he can still engage in. If he reels off another impressive win streak, then perhaps the promotion will have no other choice but to book a trilogy fight between Gus and “Bones” should Jon still be the leader of the pack at that time. After all, Jones isn’t opposed to fighting a guy a third time after stomping him out on two separate occasions. Probably the best thing about being Jon Jones isn’t all the physical gifts that have made him excel in the sport. Nor is it skill in the cage, which has come after countless hours of training in the gym. No, the best thing is the fact that he can take all sorts of drugs and get away with it. Sure, he’s been penalized and suspended and all that jazz. But the fact of the matter is, UFC 232 was supposed to be in Las Vegas last night, but because Jones had steroids in his system, the UFC moved the event to Las Vegas because Jones wouldn’t have gotten licensed by the Nevada commission. That’s something right there, folks. So Jones fought Alexander Gustafsson in the UFC 232 main event, and if you’ll recall, when they first fought, Gustafsson gave Jones his toughest fight ever. This one was pretty even for the first two rounds, all of it primarily contested on the feet. With Gustafsson wielding the same kind of lankiness, he was able to pick at his foe with strikes at distance, although Jones just kept chopping away at his legs with kicks. Jones scored in the exchanges, nailing Gustafsson with a knee and a punch her and there, but the Swede kept him honest. Then came Round 3, when Jones simply took him down, pounded on him, secured back-mount, and punched away. Gustafsson was pretty defenseless at that point, so the ref jumped in. Once again Jones is the champ. And once again, we have to stare at the clock and wonder what drug test Jones is going to fail next. Sherdog’s live UFC 232 coverage kicks off Saturday at 6:15 p.m. ET.